Rather than simply supplying incubators and brooders we’ve taken the next logical step and can also supply you with fertilised eggs. When starting your flock from scratch the egg comes before the chicken. Or does it? The fertilised egg supplier we have chosen to work with is registered with Defra and has won many awards. 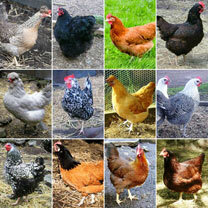 Their breeding birds live in spacious runs and are fed on top quality Garvo breeders pellets. Fertility rates are constantly monitored. Supplied in packs of 6 eggs we offer a choice of 2 selections, a Chicken Selection and a Bantam Selection. Your eggs will be despatched using the Royal Mail 1st class signed for service, so someone will need to be at home. The eggs will be packed in a purpose-made polystyrene box, using bubble wrap and fragile tape. Our supplier has posted over 10,000 eggs and to date there has only been 1 breakage in transit. So, we’re very confident that the packaging is pretty good! We expect most orders to be delivered within 7 days. During peak periods, such as spring, when demand is high, there may be a shortage of eggs so we do ask that you please allow 14 days for your order to arrive. 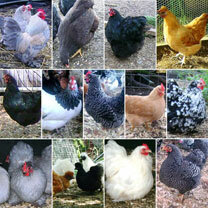 The same may happen in autumn when the hens go into moult and reduce their laying. Please remember, a hen will only lay 1 egg a day, however nicely we ask! We guarantee that the eggs will reach you intact but cannot guarantee that they will hatch. This is because we have no control over what happens to them once despatched. A broody hen may have left the nest, there may have been an incubator malfunction or power cut, all or any of which would affect the viability of the developing embryo. What we do know is that the eggs are viable at the time of despatch as fertility is constantly monitored. As fertile eggs are perishable we are not able to accept cancellations once the eggs have been despatched. Nor do we accept returns.